When the Soviet Union launched their space probe named “Sputnik” into orbit around the earth on October 4, 1957, it was a wake-up call for America signaling that the ‘space race’ between Russia and the United States had begun. That small, 180 pound metal ball, however launched more than a scientific experimental race for supremacy in the heavens. It inspired generations of young, eager, and gifted American students to view their world differently, encouraging them to dream about what limitless opportunities the event offered for mankind and for true dreamers. “October Sky” now receiving its West Coast Premiere at San Diego’s Old Globe Theatre, is based on the 1999 movie of the same name, from a screenplay written by Lewis Colick based on a story by Homer Hickman, Jr. This sparkling musical, brilliantly directed and choreographed by Rachel Rockwell, features 19 songs from the pen of Michael Mahler and a libretto by Brian Hill and Aaron Thielen that just blows the socks off the audience, thanks to the young energetic 24-member cast/ensemble who bring to life the story of the Hickam family and town folks of the fictional West Virginia coal mining town of Coalwood. The story, set in 1957, explores the lives of the Hickam family who are steeped in the tradition and culture where pride of family, hard work, and loyalty to their community defines who they are. John Hickam (Ron Bohmer) and his wife Elsie (Kerry O’Malley) are a family with two sons: Jim Hickam (Liam Quealy), the high school football team captain who is college bound on a scholarship, and younger son Homer, an earnest dreamer whose head is usually in the stars and dreams of building and sending rockets into the heavens, sensationally played by actor/singer/dancer Kyle Selig. 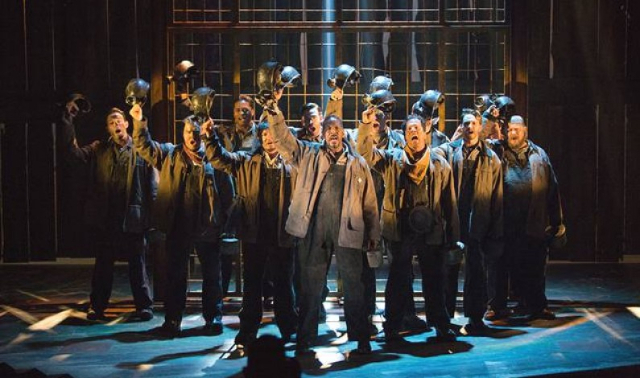 As the musical drama opens, the coal miners are seen descending into the mine singing the haunting song “To the Mine” led by Ken, their union representative and fellow miner, solidly played and sung by Kevyn Morrow. For those not old enough to know what coal miners and their families endured 60 years ago, before John L. Lewis and the union movement secured federal protection and safety rights, one could expect frequent mine disasters along with ‘black lung disease’ as a retirement reward. It was, and still is, a very tough job. 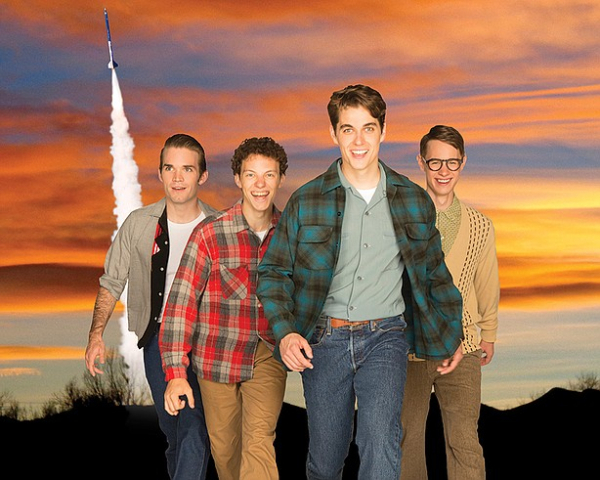 Homer and three of his high school classmates Austyn Myers as O’Dell, Patrick Rooney as Roy Lee, and Connor Russell as Quentin, portray their roles as budding rocketeers with an energy and exuberance that only comes with the confidence of youth. At home, however, Homer finds his father less enthusiastic about his science project with rockets and all that stuff. John, as the mine superintendent, reminds Homer that his destiny lies underground in the mines in the Hickam family tradition and not with rockets in the skies. Elsie Hickam’s secret feelings favor her son’s desire to make a better life for himself above ground has more than merit. It’s what has to take place. She has attended too many miners funerals and she’s determined that Homer will not follow the miner’s path. Homer and his friends find a champion for their rocketry cause in their high school chemistry and physics teacher Miss Riley, winningly played by Sandra DeNise, who runs interference for the boys with school officials. Through her influence and assistance, Homer and the boys are allowed to build and launch the school-made rockets until they are ready to enter the State science fair, then to on the National levels, which they win. 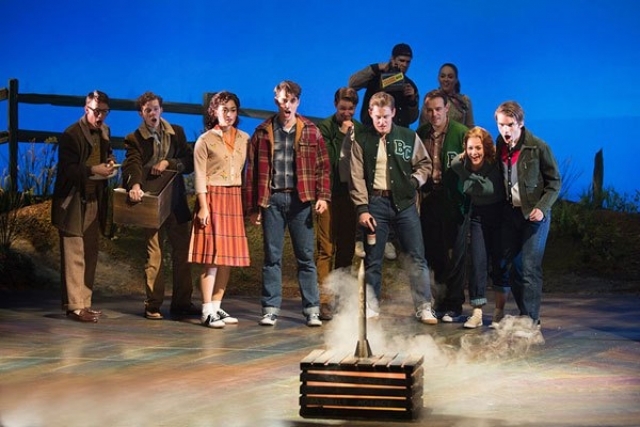 “October Sky” is an uplifting, feel-good type of play that boasts 19 songs with such numbers as “Look to the Stars”, “We’re Gonna Build a Rocket”, “Stars Shine Down”, “The Man I Met”, and “The Last Kiss Goodbye”, the latter number being especially poignant as sung by the miners’ wives and girlfriends. Ms. Rockwell, making her Old Globe directing debut, stages her production with intelligence and love of the story line. Her traffic management choices and skills are fluidly and seamlessly executed. With a cast of twenty-four it’s pretty easy to get a little crowded on stage. However, with Scenic Designer Kevin Depinet providing a stunning set and space that puts a coal mine entrance with a descending elevator, a school classroom, a family kitchen, a metal work shop garage, and rocket launching pad exteriors, the challenges of mounting this splendid production are a piece of cake. Big productions require big sets. I remember his visually stunning set design of “Sense and Sensibility” in July of this year. Large casts make it difficult to list everyone, however in every production there are always stand-outs. In “October Sky” they include Kyle Selig, Ron Bohmer, Kerry O”Malley, Sandra DeNise, Kevin Morrow, Connor Russell, Patrick Rooney, and Austyn Myers. The Old Globe has few equals when it comes to providing its directors a state-of-the-art technical arsenal from which to choose. I kept waiting to see how Ms. Rockwell and the technical wizards at the Old Globe would convincingly handle the firing of rockets from the stage. I need not have worried… they are flawlessly launched. As a side bar regarding the actual rocket launch in real life by Homer Hickam, the last one soared to over 30,000 feet! Costume Designer Linda Cho gives that spot-on 1950s look for the young people and the adults. And her grimy, coal-dusted costumes for the miners are appropriately realistic. The lighting design by Japhy Weidman enhances the mood of the miners and highlights the exuberance and athleticism of the young dancer/singer/actors in the interior scenes. The orchestrations by Bruce Coughlin are under the baton of Music Director Charlie Alterman, and those wonderful rocket launch special effects come courtesy of Markus Maurette. 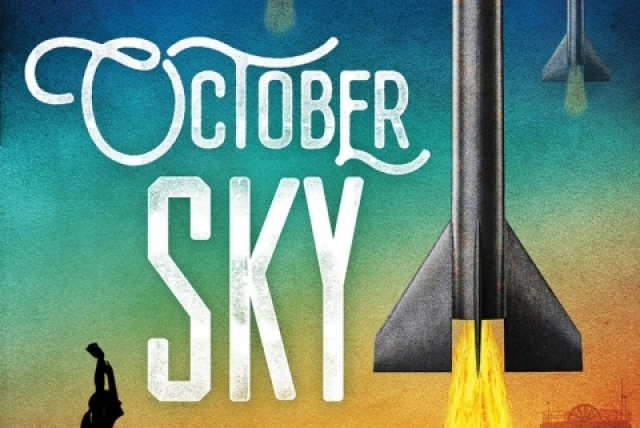 “October Sky” is a splendid musical production that performs at The Old Globe’s Donald and Darlene Shiley Theatre through October 23, 2016.